Time: 9:00 am. 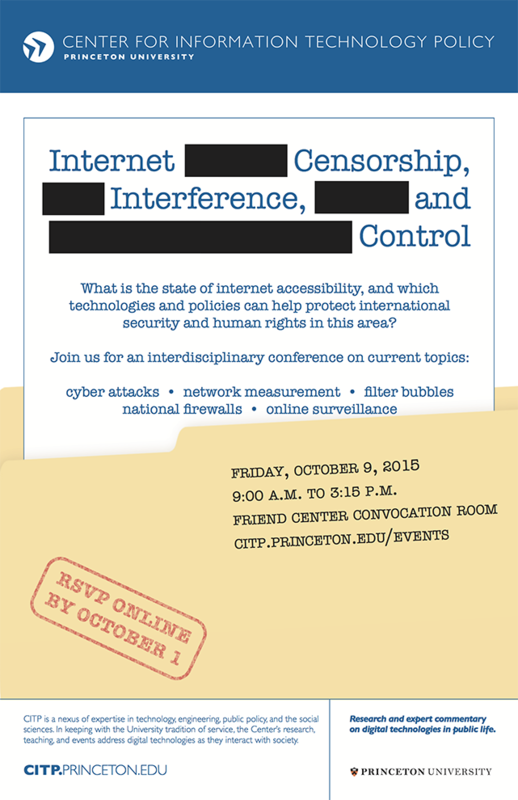 – 3:15 p.m.
What is the current state of internet accessibility, and what technologies and policies can help protect international security and human rights in this area? 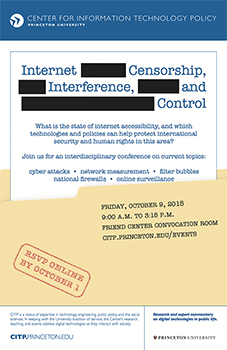 This conference will explore research by both computer scientists and political scientists into internet censorship, interference, and control. We will consider interdisciplinary perspectives on relevant contemporary questions: What is the state of the art in network measurement, and how can information about social and political conditions better inform future measurements? How should computer scientists measure and study offensive technologies, such as China’s denial of service attacks on Github, and what role should policy play in responding to these security threats? How extensive are national firewalls, internet surveillance, and filter bubbles, and how should citizens and governments respond? 1. What are the international security and human rights considerations surrounding interference with Internet communications? 2. How do we deal with offensive technologies such as “Great Cannon”? 3. What is the appropriate response to companies that are selling technology to foreign suppressive regimes? 4. What is the role of network scientists and engineers in this discussion? What is the role of political scientists? 5. How can the two groups work together to design policies to prevent and to reciprocate such as sanctions? 1. What methods do network scientists currently have to measure Internet accessibility? 2. How do we enable repeatable, reliable longitudinal measurements of Internet accessibility? 3. How can empirical network measurements complement methods from qualitative social science? 4. What aspects of sociopolitical context do computer scientists need to be aware of, and what types of data political scientists most need? 1. How can we assess the prevalence of national firewalls and surveillance? 2. What is the current state of “filter bubbles”? How can we best characterize them? 3. What are the effects of the Snowden revelations on attitudes and behavior?